Do you keep track of the number of words, pages, hours you spend each day on writing? Since last month's post on organization, I've experimented with another means to gain more productivity: keeping track of my progress. Before closing in on a method, I took a look at what other writers do. The results were helpful and inspiring. If you are interested in keeping track by using programs online, an excellent article, "Tracking my writing goals with Scrivener, Evernote and Google Spreadsheets," was posted by Jamie Todd Rubin, science fiction writer, blogger, Evernote paperless lifestyle ambassador; on his blog post, January 13, 2012. Rubin uses a combination of three tools to help him reach his writing goals each day. Scrivener - One of Rubin's rules of thumb is to write in full-screen mode to avoid distractions. Oh my, this is a lesson in itself, for I keep my cell phone near my PC so I can hear the bleeps and bloops every time I receive a new email or text message. Then I drop whatever I'm doing and hastily check to see, "Who could that be? Whoever wants/needs to talk to moi?" I never suspected that my second lesson in becoming more productive (my first lesson appeared in last month's post on October 28th about getting more organized), would be to close my office door, turn off all my devices, and NEVER, NEVER stop to check my email! Not until my writing goal is reached. Ah, but I digress. Back to the fact that Rubin sets a 500 word/session target. He doesn't stop writing until Growl pops up and tells him he's met his goal. Evernote - Rubin keeps a notebook in Evernote called "Daily Fiction Writing." He copies and pastes each day's offering into this notebook so he can go back on any given day and see what he wrote. This is done only for first drafts. Note to self: This is an excellent way to keep track of that great idea that got lost during editing. My past printed first drafts of my current WIP sit in a box; much of my computer-generated edits replaced original drafts, therefore got lost in the editing process. So I particularly would like to try this method. Google Spreadsheet - First drafts go into a Google Spreadsheet, which keep track of what Rubin worked on each day and how much he wrote. Rubin gives detailed descriptions of his tracking system and includes diagrams of his actual spreadsheets, all very helpful. If you are interested, please visit http://www.jamierubin.net/2012/01/13/tracking-my-writing-goals-with-scrivener-evernote-and-google-spreadsheets/ to read his full post. The article continues to describe how to create a task-based log for more complicated projects, and includes another table to illustrate. To read Lewis' entire article, please visit http://www.writing-world.com/tech/charge.shtml. Her book, What to Charge: Pricing Strategies for Freelancers and Consultants, might also be helpful in creating your own log system. 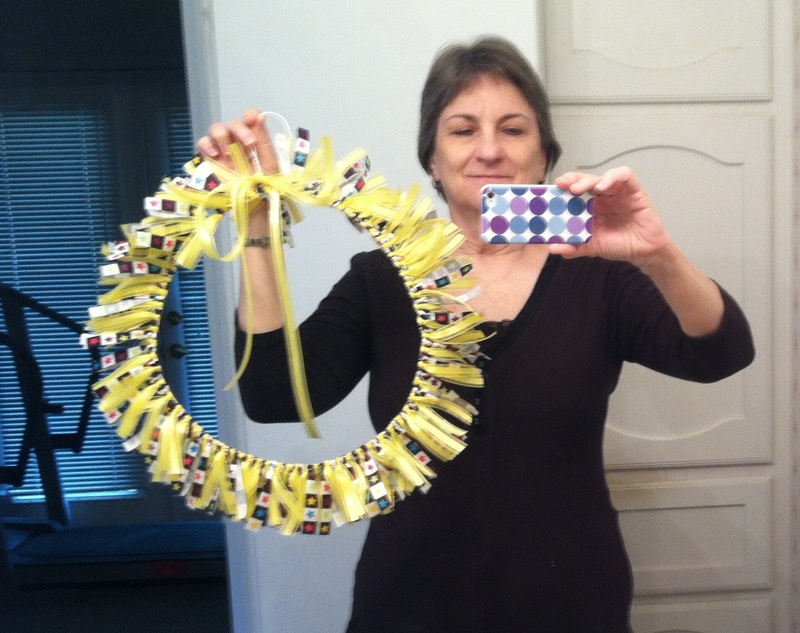 A most delightful and innovative approach to keeping track of words-a-day is the Writing Wreath that children's author Dotti Enderle created. Dottie's award-winning historical novel, Crosswire, was included in the list of "Books that Rise Above," in the Highlights Foundation workshop I attended last October. I ordered a copy and was so intrigued by it I ordered, Severed (A tale of Sleepy Hollow), out just this month, that Dotti wrote under the psyeudonym Dax Varley--a fun, fun read. She is the author of dozens of other children's books. I became acquainted with Dotti on Facebook and discovered her Writing Wreath when I visited her blog, http://www.dottienderle.com/news.html. Only add a ribbon for 650 or more words a day. Only add a ribbon for fresh work. Not revision. Dottie didn't inlcude her contract work for Ghost Detectors, only her original works. I think her rules are great. They are a strict indicator of accomplished new material. Visit Dotti's blog if you would like to see the photos she has posted of her progress in creating the wreath and details about how she made it. In my tracking system, I have included all of my writing projects, which are currently self-generated and include short stories and articles, children's fiction books, and blog posts. My main purpose, as I've discussed, is to become as productive as possible. So far, I've managed to rewrite an outline of a short story that was languishing, rejected, in my drawer (along with many of its cousins). I've begun research and begun creating the outline for my next book, and I've continued to edit my current WIP. For me, this is productive. Work prior to this effort consisted of only one project at a time. I really wanted to branch out from that and get more projects done simultaneously. What I have Learned: How distracted I've been, mainly by social media and emails. Keeping a record of my actual writing time was an eye-opener. The time spent wasn't as much as I originally thought. So, I've sectioned off times during the day when it's okay to "do email." When it's okay to take time for everything else. And when it's okay NOT to work. The rest of the time is happily spent writing. Only time will tell if I've met my goal of becoming more productive. Once that goal is met, who knows, perhaps I will be that much closer to my final goal, which is what we all strive for: To find an audience so that we can entertain our readers with our works and make a contribution to their lives. Linda Wilson, a former elementary teacher and ICL graduate, has published over 40 articles for children and adults, six short stories for children, and is in the final editing stages of her first book, a mystery story for 7-9 year olds. Publishing credits include seven biosketches for the library journal, Biography Today, which include Troy Aikman, Stephen King, and William Shatner; Highlights for Children; Pockets; Hopscotch; and true stories told to her by police officers about children in distress receiving teddy bears, which she fictionalized for her column, "Teddy Bear Corner," for the Montgomery County Sheriff's Office Crime Prevention Newsletter, Dayton, Ohio. Follow Linda on Facebook. Loved the links and the rationale behind returning to tracking the day's writing. Very tempted by the writing wreath. I certainly managed to get much more done in the days when I punctiliously did spreadsheet tracking. Thanks again, Linda, for a thought-provoking article. Great, Annie, I think the effort of tracking is well worth it. I hope it helps! Thanks for writing! Linda, this is an excellent article. It's funny, but I find myself at times wishing I'd lose internet service for a day, once a week, to get rid of its distractions. I love the idea of tracking your writing time - I really need to start doing that. And, WOW on Laurie Lewis' time frame for a 25 page document. :) It can take me an hour just to write a 1000 word article, sometimes a longer (depending on how much research is needed). That doesn't include proofing! Thanks, Karen. I didn't really think how fast Laurie Lewis' time frame is! Good catch! I take a long time to finish anything;r this is why I'm on this productive quest! Many interesting ideas. I really never thought to keep a record of how many words I write in one session. Not sure I want to know!! Thanks for sharing. Ha, JQ! I know what you mean! I have to admit my spreadsheet got tedious after a while because I was trying to keep track of too many things instead of only on writing fresh drafts. I'm now down to a one page sheet where I do as Dotti did, I keep track only of the amount of time on words fresh to the page and number of words written. Live and learn, I suppose. Linda, I've never thought about tracking like this. I'm going to try it! Great post Linda. I think tracking ones achievements helps push any goal forward. Mary Jo, I like thinking of tracking as noting our achievements. I will remember that for much positive reinforcement! Thanks for sharing your thoughts.